Nothing says fall like a harvest bake. The smell of apples, cinnamon and nutmeg will fill your house, which makes this a perfect side dish or even dessert to bake before guests arrive to your home. 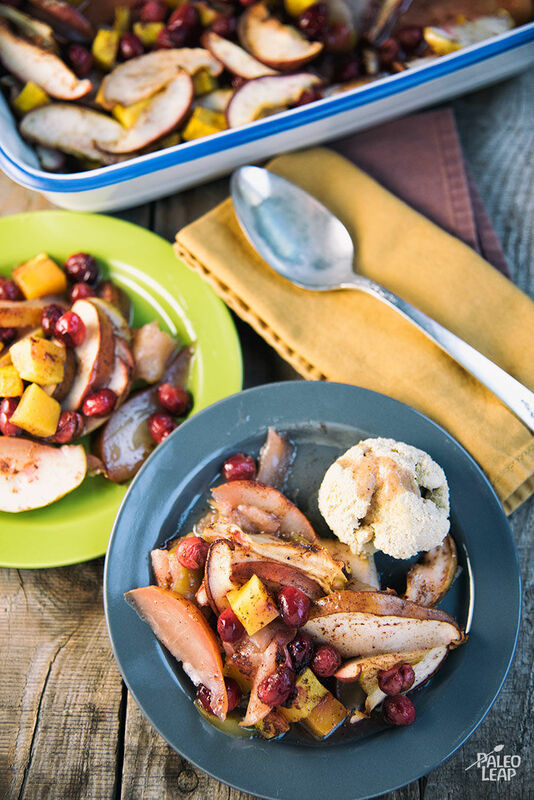 The butternut squash and apples will caramelize and be even sweeter after they’re cooked. And the best part about the recipe is the ease and simplicity to toss it all together! Cranberries are tart and bitter, and pair well with the sweet and spicy flavors of the fruit, butternut squash and spices. Fresh cranberries can be difficult to find. If you can track down fresh cranberries, buy a larger portion and freeze them to use later. Dried cranberries are not recommended for this recipe, and they’re often sweetened with sugar or “concentrated fruit juice” and inflammatory oils. Serve this as a dessert with a side of whipped coconut cream. 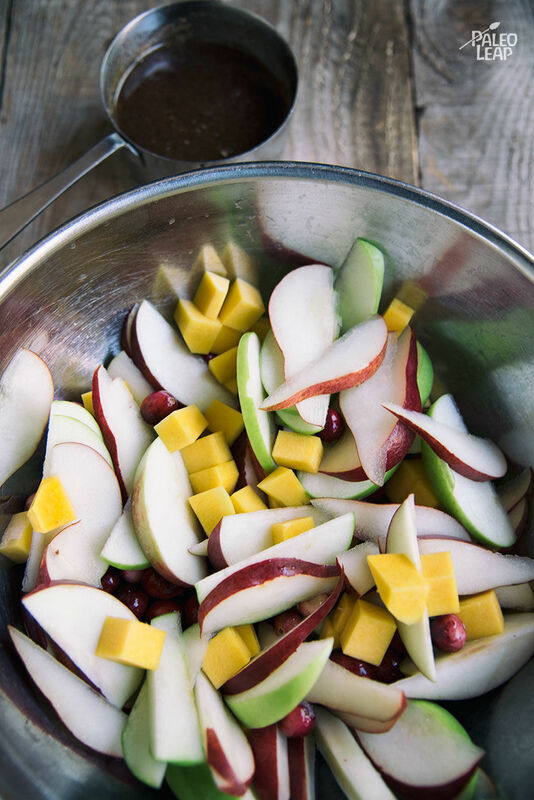 In bowl, toss together the apples, pears, cranberries, and lemon juice. In another bowl, combine the cinnamon, nutmeg, orange juice, honey, ghee, and coconut oil. 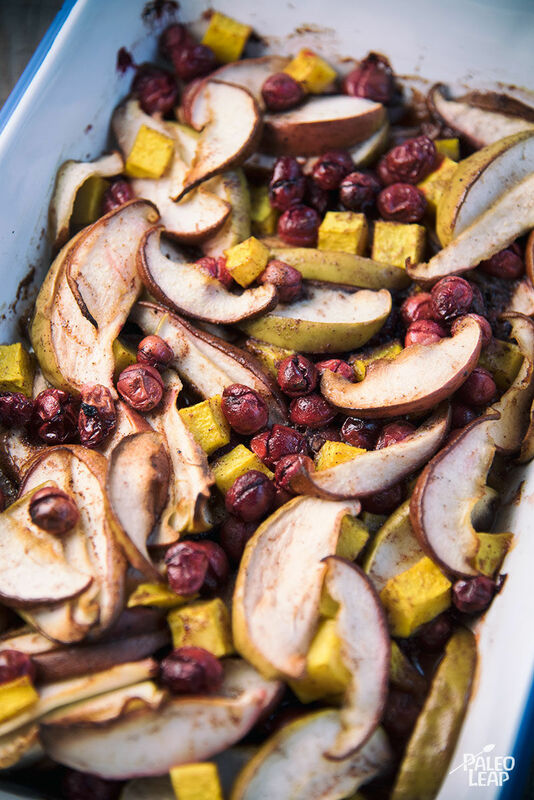 Place the fruit mixture and diced butternut squash in a baking dish, and pour the cinnamon-nutmeg sauce on top. Toss everything gently and place in the oven. Bake in the preheated oven for 40 to 45 minutes.